Continuity mistake: When she goes through the lasers it takes 2 minutes to get to the mask, but it only takes 30 seconds to get back. Continuity mistake: When Cathrine Zeta-Jones and Sean Connery are robbing the bank, she puts up the retinal goggles to her face, preparing to scan it into the computer. However, in the next close up shot, the face the goggles are on is not hers, it is wrinkly and the eyebrows are fuzzy and not defined. Continuity mistake: When they are staying in Malaysia, Zeta Jones is mentioning that they have to do the "electronic robbery" the following night. As a matter of fact it has to be the night after that one, because there are two bits of darkness - one where Sean Connery plans the job and one where they fight and make up. Plot hole: Catherine Zeta Jones says that she needs ten extra seconds after midnight to download the program that collects the billions of dollars from the international bank. In the movie at two different point, she states that after 11:00 PM the device she linked to the clock is gathering an extra 1/10 of a second every minute to allow for ten seconds at midnight. If you take a tenth of a second a minute for 60 minutes, you end up with only 6 seconds. 4 seconds short of the required 10. Some people say she only says "a fraction", but she explains the scenario twice. In one instance, she indeed says a fraction, the other time she definitely says 1/10th of a second, which is wrong. Continuity mistake: When Catherine Zeta-Jones practices with the bells and strings maze, she is careful to lift her left leg over one of the first strings, then brings her body through, and then brings her right leg over the string. Too bad when she does the heist of the mask for real, she lifts her left leg over the unseen laser beam but keeps her arms dangling as she brings her right leg over. This would have set off the alarm because she forgot to lift her arms over the laser beam! Continuity mistake: Catherine Zeta Jones isn't supposed to touch some strings that she is working her way through, but you see a bell hanging on the string move - it's agreed by the characters that she does do a perfect job, when actually she would have set the whole alarm system off. Continuity mistake: On the bridge between the Petronas Towers in Malaysia,after Mac and Gin have swung from the lights,and broken half of them, in the next scene, showing the bridge, all of the dangling lights have been neatly trimmed away! Continuity mistake: When Gin and Mack first arrive at Mack's castle, he offers her some whisky. When he hands her the glass, the amount of whisky in it keeps changing: When the camera faces Gin, her glass is about 3/4 of the way full. When the camera faces Mack, her glass is about 1/2 full. Then the camera goes back to Gin and her glass is again 3/4 of the way full. Revealing mistake: Before entering the Petronas Towers on New Years Eves, Jones emerges form a limousine. In this shot, as in the next few shots, there is a lot of flashing lights from photo cameras. However, when we get a shot form the crowd, these flashes of light appear out of nothing. No one is holding a camera and flashes come from places where no people are standing. Clearly, these flashes are added later. Continuity mistake: In one scene we see the characters at night in New York, and they have (I think) 4 days to the millennium. Next scene they are in Malaysia in the morning with 3 days to the millennium. This can't be b/c Malaysia is ahead of the east coast in terms of the time zone, so they would have lost a day. Plus, it takes at least 12 hours from Detroit to Osaka Japan. Then another 6 hours to Malaysia. Continuity mistake: When Jones and Connery are flying to Mac's castle they fly past a lighthouse. This scene was filmed in Argyll in Scotland. They fly past the lighthouse the wrong way for the castle. The castle is on Mull which is the other way. They are flying to Oban. 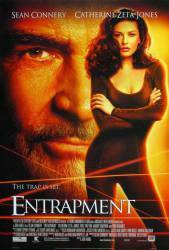 Continuity mistake: In the scene in the tunnel following the theft of the Golden Mask, Jones' wet hair changes places on her face, though not in conjunction with being dunked by Connery. It just shifts with different camera shots. Continuity mistake: A graphics expert said that the guards on the platform, bridge or whatever are fake. One way you can tell is that they always pass each other at exactly the same point. 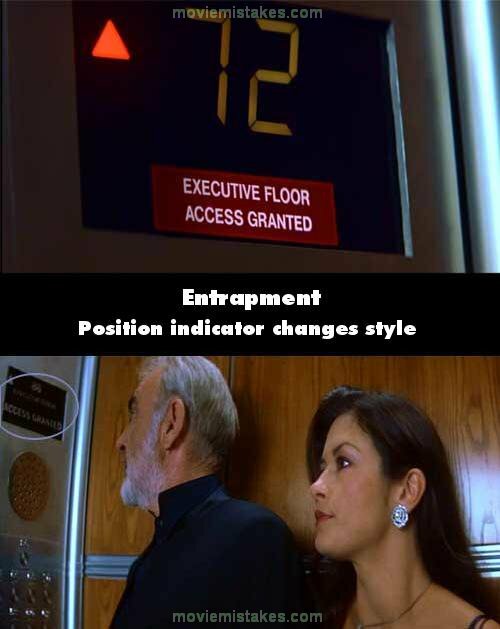 Continuity mistake: In the scene where Catherine Zeta Jones and Sean Connery are practising the red string alarm system Catherine Zeta Jones is blindfolded. At the beginning, before she starts going through the string her blind fold is dark red and when you see her again in the middle of the exercise it is black. Mac: Oh what a tangled web we weave, when first we practice to deceive. But practice makes perfect. The street that Sean Connery is parked in waiting for Zeta-Jones to leave the antiques shop, is the same one that Hagrid and Harry walked down in the Philosopher's Stone when they are heading for the Leaky Cauldron.